Angle for local species in waters off Punta Cana during this sport-fishing cruise. Enjoy 4 hours out on the ocean catching Snapper, Mahi Mahi, Dorado, Sailfish and Wahoo. Interact with like-minded fisherman, from professional to novice, and even get a chance to make some big catches like White or Blue Marlin. 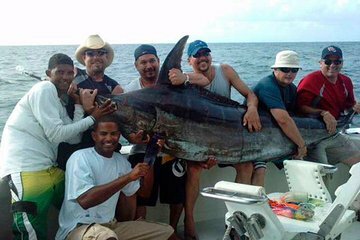 All necessary equipment and the advice of a professional fishing guide are included, in addition to round-trip transportation from select Punta Cana hotels. This was honestly one of the worst experiences we have ever had. First off this was on my husbands bucket list of things to do and we are so sad that this is how the trip went. Our shuttle arrived to our hotel at 7:00AM as stated. I've used Viator in the past and was always able to show the driver the e-voucher but apparently on this trip we were supposed to print the vouchers. I explained to him that I did not print them but could show him on my phone. He stated that We need to have the vouchers but I will let you slide this one time in a very rude tone. We then rode around picking up people then meeting in two different spots to drop them off and get more people for almost two hours! We arrived at the marina at almost 9:00AM. The driver stated that we would need to wait there another 20 minutes until they had the boat ready. We were waiting in a shop where the workers were hassling us to buy things in their shop. We were then shuttled to the fishing boat via a small aluminum type boat. The driver of the boat introduced himself but that was it he gave no instructions to us on safety, what we were doing, etc. There were 9 people on one boat, from what we have heard this is way too many people on a fishing boat. We kept thinking who was going to reel in the fish when they were caught. The whole boat ride there was a big lack in communication. The guide I use the term loosely as all he did was stand around spoke very little to no English he could not even understand when I asked Where are the fish. The only communication from the guide was that if you had to vomit do it over the side and he asked if we wanted anything to drink. We rode around for an hour and a half and not one word was spoken to us from the guide. We were not even sure if we were fishing or not. We were in the interior of the boat inhaling the gas fumes for hours with no one informing us of what was going on. The family that was with us ended up getting sea sick and also told us they paid extra for a private boat so they did not have to put anyone else through this. Two hours into the trip the family with us wanted to go back as we were not catching any fish, the guide was up on the top of the boat not helping us or giving any instructions and they were sick. When we got back to the shore the guide wanted us to sign a form stating we asked to terminate the tour early due to our physical condition. This was not the case so we said we would not sign it, he then stood in front of my husband and said we could not get off the boat until the form was signed and if we did not sign it then we were going back out fishing! In order to avoid a confrontation he signed the form. This so called fishing charter was the worst excursion I have ever had and I'm a well seasoned traveler. We were basically told we could not leave the boat without signing a form against our will we had a guide that could not speak English even though he is running a boat that has a majority of tourists that speak English on it. The transportation to the excursion was complete chaos and was almost two hours. The marina was full of hagglers trying to get us to buy things. I would NEVER recommend this company to anyone. I don't even think had we caught any fish the trip would of been any better as with 9 people on one boat the odds of us all getting to reel a fish in are slim to in our case none. Capt. Jose and 1st mate Danny were helpful, friendly and polite. The boat was a 32 ft. everything was as explained/described. My first time ever deep sea fishing and I was chumming the fish with my breakfast. Not sure if they used the "right technique". 5 stars for Viator. We had not a single issue with pick ups or drop offs at our Hotel. We had an amazing time on 9/3/15. We had a afternoon trip 4 hours and hauled in 25 mahi and 1 cuda. At one point we had 5 fish on at once. The Capt. and first and second mate worked like a well oiled fishing machine. No Joke one of the best fishing trips I have ever been on.